Previous Star Wars films such as Attack of the Clones and Revenge of the Sith have screened at the Cannes Film Festival, but this is the first time Disney brings one of them to the Croisette since the studio took over the franchise, and one has to wonder if they are trying to deflect the attention from all the rumours of a troubled production that have been flying around for months. There was the departure of the two original directors, Phil Lord and Chris Miller, who were replaced by Ron Howard, said to have reshot as much as 70% of the film. Then the studio was reportedly unhappy with Alden Ehrenreich's performance, and an acting coach was recruited. 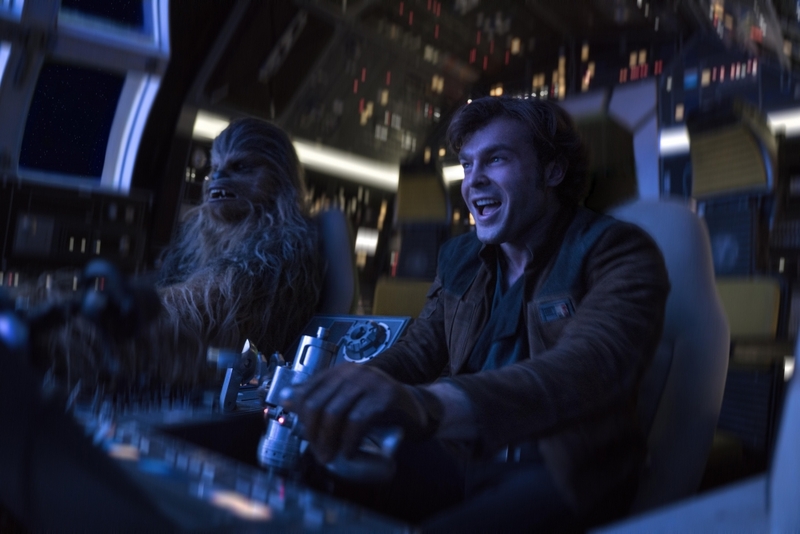 Solo is far from being the only blockbuster with a few bumps along the way however, and this should not matter to the audience if the finished product delivers. So does it? Solo can be seen as the first real spin-off of the original franchise's storyline, since the first official one, Rogue One, was pretty much a direct prequel to A New Hope. So it is refreshing to be able to explore this universe without the entire fate of the galaxy at stake, without the force, and with a lighter touch. Or at least, it should be. Except that, right from the start, the film hardly ever takes off. It might veer off from the main series of films, yet it still features a younger version of one of its most iconic characters. As such the film often feels like a box ticking exercise when it comes to explaining his backstory, all that makes Han, well, Han Solo, and it is not actually particularly interesting. Did you always want to know why Han Solo is called Han Solo? Well, you got it. At least Chewbacca gets a very amusing introduction, with a winning nod to a set piece of the original trilogy. Solo is a heist film, and purposes itself to be a lighter adventure, yet this playfulness is derailed by the early and grim demise of some supporting characters, some backstabbing twists and a backstory of rebellion and oppression. As a result of this confused tone, the film lacks both of a sense of fun and of depth. It is also frustrating that the script treats it as an origin story with a very obvious aim to develop the storyline in further sequels (Alden Ehrenreich has signed for multiple films) rather than being its own, contained story. Ron Howard has always been a competent rather than remarkable director, and, a frankly mad scene aside involving a space vortex and a gigantic tentacled monster, Solo is flatly directed and particularly dull visually, especially compared to the fireworks and real original touches Rian Johnson recently delivered in The Last Jedi. As for the action, the film peaks too early with an impressive scene on a rotating train that features prominently in the trailer, yet nothing that follows is ever that memorable. As for the cast, the good news is that its quality is completely uniform. The bad news is they are all uniformly unremarkable. The usually effervescent Woody Harrelson looks particularly bored, Emilia Clarke is given a character ark that threatens to become interesting (even through its foreboding is far from subtle! ), yet she does not seem to know how she is supposed to play her character. 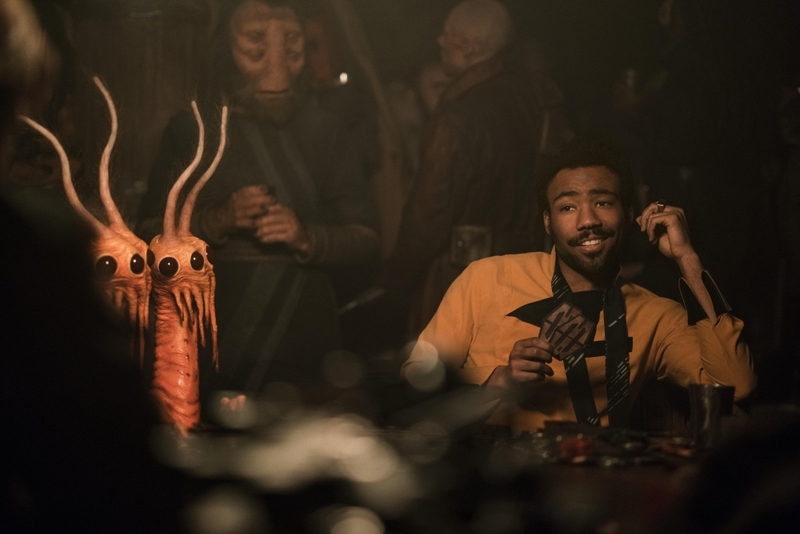 Even the (rightfully) celebrated Donald Glover, who, according to early rumours, was supposed to steal the show, does not actually sparkle much as Lando Calrissian. The only saving graces are Paul Bettany as a baddie, who is the only one who seems to have some fun, and Phoebe Waller-Bridge as an equal opportunity droid called L3-37, who has the best lines but sadly far less screen time she deserved. As for Alden Ehrenreich as the young Solo, he is fine. He delivers an interpretation of the character and makes it his own... but it pains me to say, especially considering how much of an impact he made in his breakthrough part in Hail, Ceasar!, he does not shine. He is perfectly fine but lacks of presence and swagger. Solo is a disappointment, one that results from Disney not actually knowing what they wanted with this film, having hired some fresh and unpredictable directors, only to get rid of them because of these exact qualities. One should hope they learn their lesson for the next spin-off, rumoured to be centered on a young Obi-Wan Kenobi. Official Selection, Out of Competition.